I’m delighted to announce the launch of the most relaxing adult colouring book ever to hit the market. Unlike other colouring books for adults, the original Draw Your Own Colouring Book invites you to fully express your creativity by first drawing your own images before colouring them in. That’s twice the fun of a normal colouring book, and twice the relaxation, all for the same low, low price, with well over 50 stunning pages of utterly blank space for you to express yourself. Even more exciting, every owner of this book is invited to scan and email their finished drawing and colouring creations to bloggerheads DOT com AT gmail DOT com for a chance to be part of an upcoming project: an already-completed colouring book for sale to doctors, dentists, and anyone else with a waiting room. Each book come complete with a title page, a complete set of instructions, and a touching dedication to publishing guru ‘Michael Green’. If you want to enjoy twice as much meditation time, if you want to appreciate a true moment of zen by overcoming your attachment to ready-made drawings, then this is the book for you. If you want to give your semi-loved ones a gift that requires very little thought or imagination, but you want to offset your laziness by being deliberately ironic about it, then you are mere minutes away from finishing your Christmas shopping! In honour of the book’s theme, a book launch has been planned where no-one will be invited to a location that will never be announced. 6 Responses to "Draw Your Own Colouring Book"
I daresay you can count on Mr Green to attend the launch shindig. It's not as if he's too busy or anything. Haha, enjoyed this. If only I had read it before Christmas. Damn it!! You should show some actual inside pages. I won't buy without a better idea what's inside. Will definitely be checking that colouring book out! Hahaha! 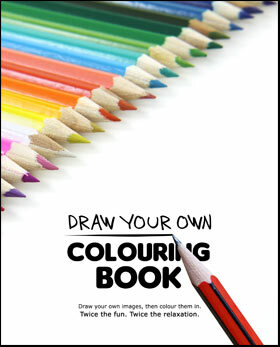 Blank Colouring book?! Great gag gift this Xmas! Protected by Invisible Defender. Showed 403 to 663,144 bad guys.